Chris Weisman appears again with a delightful ditty about "bicycle operator and co". Near the end he refers to the BOAC in the Beatles' "Back In The USSR", which that eminence gris of Drum Media, Ross Clelland, pointed out to me stands for "British Overseas Airways Corporation". I prefer Weisman's acronym. More also from Sam Amidon, including a track from his earlier album All Is Well — more highly authentic American folk. Matthew Herbert’s new album is as conceptual as ever. One One indicates that he has reduced his sphere of sample-sources to nothing but... himself! He plays and sings and produces and edits everything here, and his unsteady vocals lend a special quality to the familiar melodic cadences which are usually sung by one of his female accomplices. Lovely stuff. B. Dolan’s album continues to impress. Heavy tricky beats and great vocal delivery. Following this, we were joined by the estimable Shoeb Ahmad from Canberra, who popped in for a chat and a chance to play some favourite music of his. Shoeb's work with Spartak and solo, and his label hellosQuare Recordings, have provided much listening fodder for Utility Fog over the years, so it was great to hear these selections, and also some of the connections that brought them forth. That's how we go from German postrockers to rococo rot to Blur to Massive Attack (connected by Krautrocky grooves) and later the alt.country experimentation of Califone and the gorgeous classicism of Hauschka. Listen to the re-play below for much discussion. The "triple play" after Massive Attack is an interesting beast. Cold Cave is one of those bands combining the post-punk disco/electro-pop thing (I tried to get "goth" in there but wasn't sure where to put them hyphen) with a bit of the noise biz, and with both Dominick Fernow of Prurient (and Hospital Productions) and the fabulous Sarah Lipstate (Noveller) involved, at least live, it's got to be interesting. Continuing in the noise-meets-ambient sphere, we have some newness on boutique label Monstera Deliciosa, run by Grant Hunter of UFog faves Crab Smasher. Reunion Sacred Ibis is a solo act from Melbourne, and both "pana-wave" tracks are thrilling bits of broken-down distorted electronics. Sydney's Edwin Montgomery should be familiar to UFog listeners, and his latest album's title says it all: Please Be Quiet and Play Your Guitar, Vol. 1 sends his guitar through various pedals to produce quiet listening music. Meanwhile, Gail Priest has some new tracks up on Bandcamp for only a few dollars. Disquieting vocal, acoustic and electronic sounds and one of the big recommendations of the week. A couple more tracks courtesy of Shoeb, including a bit of processed field recordings from Bangladesh, and then we're back to Sydney with Vorad Fils, aka John Hassell from Seekae. Anyone familiar with his trio's music will know what to expect, but this album certainly delivers — despite being written & recorded in only a few weeks. Glitched-up hip-hop beats, verging on the wonky side, with synths and (acoustic) piano processed to buggery. After confirming that it wasn't any of the classic idm folks I thought it was, I suddenly had the epiphany that it was much closer to home - a wonky producer from across the Atlantic. No wonder it had been so familiar — Paul White’s Clean Dub of Tranqill’s Payroll had been one of my favourite songs of last year! This led me to track down the original, which is none other than Greek synth legend Vangelis, he of the Blade Runner soundtrack. The track "Spiral" comes from years earlier - 1977 - starting with these synth squiggles and then moving into a sequenced line of the sort we'd hear in the work of Emeralds and Oneohtrix Point Never these days. It's amusing to hear that not one, not two, but three artists have sampled this same squiggly line within about a year - the third being that manufacturer of drum'n'bass anthems Sub Focus, who takes not just the wobbly/warbly beginning but also the pomp and bluster of the big organ lines to introduce his hard-hittin' beats. All very silly but fun enough. Some very special stuff tonight from artists familiar and totally new. LISTEN AGAIN, see link at bottom. Starting with an interesting outsider artist of sorts, a singer-songwriter of tremendous talent working in a charming lo-fi way which perfectly suits his songs. Chris Weisman had a collaborative album with Greg Davis on Davis' autumn records last year(? or the year before) which showcased Weisman's songwriting in an even more experimental context. These songs are wonderful. Enjoy! A discussion of Dennis Potter's amazing postmodern TV series The Singing Detective (beware the American remake in from 2003 or thereabouts!) prompted me to pull out the soundtrack, from which I took a genius track from Duke Ellington & his Orchestra — classic swing jazz as it should be done! Next up, first of a few tunes I will have played tonight by Sam Amidon, whose album I declared to be the album of the week last week, and then proceeded to only get to one track! It wasn't the feature album, m'kay, just the amazing release of the week, and it is wonderful, American folk musics — I'm hearing Appalachian in there — filtered through a modern sensibility with wonderful arrangements, but still a real folk authenticity. So we have him, and also a track of Nico Muhly’s with Amidon singing & playing banjo. In between, some gorgeous drone (of a sort) from UFog favourite Ian D Hawgood. He does "drone" in a really organic and acoustic way, mixing in field recordings, and making pieces which, like the works of Machinefabriek and Jasper TX go in surprising directions... Highly recommended. The folk of Sam Amidon moves into the passionate alt.hip-hop of B. Dolan, whose Alias-produced album Falling House Sunken City is a masterpiece, hands-down. This is a relatively low-key number, to fit in with the surroundings, but later on we'll get to the real meat. Political lyrics, full-on delivery, and brilliant beats. I hope there are some pots and pans among the percussion. Of Blondes I know little but they are part of this synth-based noise and dance scene that's springing up, and they made the wonderful choice of getting Oneohtrix Point Never to remix a track. Lovely lovely. Can't wait for his new album due in the next month or so. And our very own Pimmon, who has been soaking in these sounds from cassette releases galore over the last year or so, has put out a cassette of his own synth-psych. It's pure heaven, and he's playing this Friday in Sydney — no excuse, 6:30pm start, great line-up, you have to go. This is Refraction #2 for 2010. MySpace event here, Facebook event here. Oh, and the track I played was nearly 12 minutes long, but this Emeralds tune that followed it was about 18 minutes - and totally worth it, kids! More synthesisers taking us on a trip into... er, the afterlife? It was soooo tempting to play one of the longer pieces from this Ambarchi / O'Rourke / Haino album (a collaboration between three greats if ever there was one). But given that they're 25 and 31 minutes, I thought we'd better stick with the one that's a very radio-friendly 3:44. With Jim O'Rourke on piano, Keiji Haino on vocals mainly, and Oren on guitar, it's a splendid sound. Two new tracks from Crab Smasher tonight. The first is from a shortly forthcoming cassette release on Grant Crabsmasher's Monstera Deliciosa, and it's one of the most beautiful things they've created - not far from the Pimmon & Emeralds stuff above, even. The second is a lovely piece from their recent 3” on CURT. Always nice to receive new unknown music, especially from Oz. Melbourne's Trjaeu make a nice form of mostly-instrumental post-rock, with fun rhythms and a warm sound. Meanwhile, London's Three Trapped Tigers are doing their take on a live version of IDM, effectively. Crunchy messed-up beats, keyboards and bass. They are very good at this, and should be going places anytime now. And then two hard-hitting tracks from B. Dolan. Seriously fantastic beats here from Alias. The latest Glaswegian purple dubstep hero seems to be Rudi Zygadlo, and he has a single on Planet µ with multi-tracked vocals and woop-woop basslines. Cool. And Perth's Carl Fox takes a bit of a dubstep turn near the end of his little bit of indietronica. His self-released album has some delightful bedroomtronic production. And thence we return to the home-produced sounds of Chris Weisman, with looped percussion and guitar, and lovely vocals. The guy has such an amazing pop sensiblity. Final artist of the evening, with two tracks comes courtesy of the estimable Mr John Part Timer, late of Melbourne, Australia, who informed me this week that I had to listen to the music of his UK buddy James, aka Jazzy Jones Is Nano. His music is a pretty astounding blend of Autechre-style beat-meddling and in this case some well-considered orchestral sampling. This guy needs to be released! Jam-packed show tonight, including an interview with the lovely Michael Pulsford of Battlesnake. Check them out along with various other excellent acts this Saturday night (17th of April) at the Excelsior in Glebe. Download the interview separately via this link (~30MB). LISTEN AGAIN to the whole show via the link at the bottom! Started with the latest edition of the L-O-A-F Explorers' Club, with Brighton collective Sons of Noel and Adrian contributing beautiful string arrangements and a doom-laden folk song. Sydney band Parades’s first album has been a long time coming. I've been sitting on this Underlapper remix ever since Greg Underlapper sent it to me months ago, and am very excited to have been able to play it tonight. Bit of a 65daysofstatic feel, and with a new 65dos album out soon, I'll be sure to give it another spin then. I just happen to have heard a preview of the new Underlapper album this week and I can't wait to play you that one! Unspecified release date as yet though. Next up, a bit of a hint of things to come with some electronic music. Two drum'n'bass-influenced tunes, starting with Roel Funcken, who with his brother Don has produced some of the best idm of the last decade or more as Funckarma. Funckarma have always looked outside idm for influences from hip-hop, drum'n'bass, techno and these days dubstep, and all those are present on Roel's debut solo album Vade. This track, in collaboration with another Dutch idm hero, Kettel, is distinctly drum'n'bassy, and I approve. Also on excellent German electronic label Ad Noiseam is a new EP from Enduser, another old favourite of this show. In fine form, Lynn Standafer is up to his usual tricks, sampling lovely female vocalists and overlaying huge bass synths and drum'n'bass beats. This time it's the turn of Miki Berenyi and her beloved band Lush, and I'm such a fanboy of the album it's off that it took me about 2 secs from the first sample to go running to the CD shelf and grab my copy, and we heard the original source song tonight as well. Next up, Michael from Battlesnake talks about his band's history and philosophy of music-making, and we heard a couple of songs under the interview plus another after. Their music on the album Umlaut is a beautiful mix of improv influences and cinematic evocativeness. Being bass, drums and organ/keyboards, they have a pretty unusual sound. Should be a top gig this Saturday. We also had one precious song from an altogether brilliant album from another Melbourne band, otouto. They're making quite a stir at the moment anyway, with the Brown sisters' lovely songs and multiple instruments, and Kishore Ryan's unbeatable drumming (see his other band Kid Sam). ...And then we're into something quite unusual and special. The Internal Tulips’ debut album on Planet µ prompted a bit of a trip down memory lane, as the band is made up of two most excellent idm/experimental electronic artists whose work was worth exploring independently as well as together. Alex Graham put out two 12”s as Lexaunculpt in the late '90s, and was for a while the wunkerkind, the next big thing. The music is very much the idm of the time, skittering beats with a hip-hop foundation and tiny melodies, and I've really been enjoying nodding my head along, having pulled the vinyl off my shelves earlier this week. He also had one quality album on the µ, but even that was back in 2003. Brad Laner, meanwhile, has had many projects including indie rock band Medicine, but it's as Electric Company that I'm most fond of him, and that's the most apposite of his identities for this new project anyway. He had a few albums on Tigerbeat6, moving from minimal glitchy electronica to something like maximal glitchy electronica. The album it's hard to be a baby, from which I took two tracks tonight, really is a bit of an unknown classic, with crunchy beats, acoustic and orchestral samples galore, and just a great feel to it. I also dug up a collaboration (or at least Lex remixing Electric Co) from years back, and in between we had a number of slices of rather bent pop from The Internal Tulips. This act very much shows their pedigree in electronic music, but also Laner's pop experience. I have a feeling it's a grower, and I'm already really liking it. One to keep an eye out for. From here we go even further into electronic territories. Our gateway thence is the incredibly intricate work of John Kameel Farah, who combines his classical piano technique with elements of jazz and Squarepusher-stylee drum programming. Crazy stuff from Toronto - we like. This came from the Ad Noiseam store, while I was picking up a bunch of new stuff on the label itself. 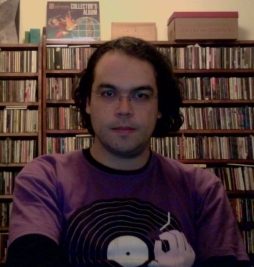 Nicolas at Ad Noiseam has a very fine and wide-ranging selection of electronica, breakcore, dubstep, dark ambient and more. I also found the CD version of the Underscan label's now series. I have a couple of them on 12’, but it's great to have CD, and Funckarma’s contribution is worth the whole thing — they've often hinted and drum'n'bass in their crazy drum programming, but this is pretty much the real deal. Another Enduser track samples another female vocalist, and we have a brief but full-on track from Hymen artist Defrag. Back to Roel Funcken, whose next offering is a kind of hip-hoppy 2-step thing that takes us conveniently into a mellow 2-step kind of tune from Scuba’s beautiful new album. Even though it verges a bit too much on the 4/4 minimal Berlin dub-techno thing, there's a lot to love about Triangulation and it's garnering well-deserved praise from all over the place. On Ad Noiseam, Broken Note’s debut album collects all their 12” tracks on CD, making for a very heavy affair, mostly dubstep with some bits of drum'n'bass in there. Not unexpectedly you wouldn't expect to find this on the dancefloors of drum'n'bass clubs, but it fits the bill along with the breakcore-verging stuff I've been playing tonight. And my last Roel Funcken track of the night has some very nice bass growls and off-beats of the dubstep variety. Good evening! It's nice to be back :) You can LISTEN AGAIN to this selection of prime cuts via the link at the bottom. The fabulous Crab Smasher launched a new 3” CD this afternoon (and so did I as it happens... Raven site desparately needs updation, don't look!) It's brilliant stuff as per usual, and you need it. Ex-Adelaidian London resident Inch-time has a new EP coming soon (on cassette dammit) via Static Caravan, and it features some ace remixes. On the first for tonight, Canberra's Shoeb Ahmad takes the original, loops segments and adds a Hood-inspired vocal over the top. While in Melbourne last week, I visited the usual slew of record stores and turned up a number of gems. Among them was a 2006 album from Zelienople called stone academy, from which we took this piece of lo-fi drone-country (I just made that genre up). Couldn't resist a replay of Peter Broderick’s gorgeous remix to follow this. Jasper TX’s double CD from a few weeks ago is still getting a few turns on the player, both the original tracks and the remixes, and this week we get the aforementioned Zelienople with an extended Zelienople-ised version which I played a goodly portion of. Speaking of goodly portions, Machinefabriek’s new 3” CD with Freiband is over 20 minutes long, so I played the lovely first section, droney goodness and hi-fi noises. final is one of the many monikers of Mr Justin Broadrick, taking his interests in punk rock & noisy electronics into thoroughly atmospheric territory. I was hoping to play more than one track from this tonight, but tune in next week for more. Next up, another ex-pat Aussie, J.G. Thirlwell as Manorexia. Sometime I'm gonna do a big scary special on Foetus and his various other guises. He has a new album out on the Tzadik label, based in his long-adopted home town of New York, and appropriately for John Zorn's label it's chamber classical renditions of his more soundtracky warped sounds. I played an example also of what Manorexia sounds like when it's at home (I think both previous albums are semi-out-of-print these days, but try New York institution Downtown Music Gallery for lots of his back catalogue. The drum'n'bass influence on the latter track allowed me to sample another of Icarus’ genius tracks from their just-released live album all is for the best in the best of all possible worlds. I did a big special on them two weeks ago, if you like what you hear. Inch-time remixes himself, and then we have one of our regular Part Timer exclusives, sent in just a couple of days ago. This time it's a forthcoming remix of Tokyo Bloodworm, with gorgeous string samples mutated in the mix. John's work is getting better and better (not that it even needed to), but that said, it sounds like Tokyo Bloodworm (who had a collaborative release on Moteer a couple of years back) are doing excellent work too. Melbourne's The Scrapes are up next, following the string theme, and while there's a clear influence from The Dirty Three here, the violin loop which begins this tune in particular is very lovely. You can find this album via Birdland, and they'll be playing at the Cad Factory on the 18th of April alongside, yes, Mick Turner from the aforementioned Three playing with Jeffrey Wegener (Laughing Clowns) and Sydney's princes of postrock Founder. Tula came to me via 7” vinyl on Static Caravan, and all I know is that she's a Swedish folk singer and this song is absolutely wonderful, 'nuff said. CoConuts are two Melbournites and a New Yorker and make very dark pop songs somewhat along the lines of HTRK's noise pop. It's repetitive and dirgey, and sustains that feeling throughout. Also released on No Quarter. Dubstep duo Vex'd took the genre into distinctly industrial territory rather early on in the piece with their singles and then double album on Planet µ. Sadly the two then moved to different parts of the world and were unable to continue working together, so after a serious gap, the few tracks they'd produced towards album #2 have been collected along with various remixes and other appearances, separately and together. It works impressively well as an album, and even those who like me have a number of these tracks already, there's enough there to make it well worth grabbing. The first track I played goes into Various Production territory courtesy of Anneka's vocals, and the Plaid remix is beautifully dark & crunchy. Followed by... yes, finally... the new Burning Star Core! It's 66 live performances edited together into four parts, each 16+ minutes long. It is, in a lot of ways, fairly relentless noise - sometimes BxC's live performances, with a plethora of guests both regular and special, can be a lot more raucous and "free" than his immaculate (and still uncompromising) studio creations. This has a bit of both - very lo-fi but with a guiding hand over it. There are some brilliant sections, one of which is the opening section, with driving (albeit buried) percussion and, yup, NOISE. We could probably class Crab Smasher as some kind of noise group - certainly it's free improv, although the three tracks on their new 3” CD are reasonably sedate in their context. Check it out. Equally, our very own Pimmon represents an outpost of noise/drone, and here he creates something singular for Inch-time. Another singular Sydney voice is Blake from Telafonica aka Lessons in Time. Beats made from household objects, a real indie aesthetic to electronic music. Bring on the new album! Out now, or any minute, is the 9th installment of Feral Media’s POWWOW series, this time coming from Sydney electronic artist Gentleforce. It's mostly ambient electronica, and there are a few classic (as in "what a classic sound", y'know?) tracks here. And finally, another track from the latest release on Sydney label Preservation, folky electronica from Ben Swire. Really pretty stuff, this album's a grower.